I didn’t go on a trip to Europe. I didn’t have a baby. I didn’t get a book deal. I didn’t even lose a kilo of weight. In case you missed me, in case you were wondering why I was gone. I was buried in work. I’ve found that that is never reason enough, never glamorous enough. So for your interest, our water purifier was down yet again and I was wondering when and why we moved from boiled tap water, my kids’ colds are back again, they lie glibly that they didn’t eat ice cream and I have absolutely no control, and I end up with the most unexciting health issues that are not serious enough to get admitted but still a pain and its official now – even my doctor has declared that I need to lose weight. Now don’t you think “buried in work” sounds more interesting? Among other things, I am contemplating changing up a few things on Foodbetterbegood, having some regular themes – diet friendly recipes, one-pot meals and make-ahead meals being top on my list. Do chime in if you’ve got any ideas. I did cook but in spurts, for guests, for occasions but not the daily grind. 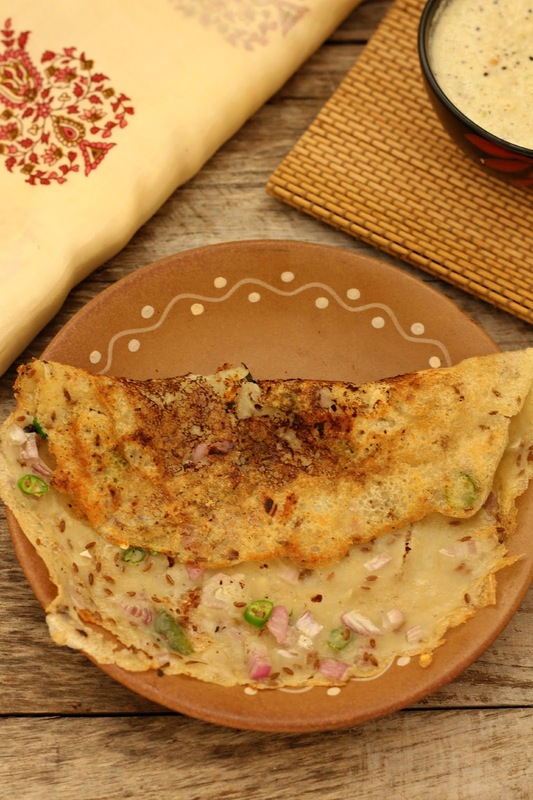 I eased into the daily routine with this easy, not-instant but nearly so Maida dosai. There is only one way to eat it and that is hot, right off the stove with some freshly ground coconut chutney or milagai podi (gun powder) mixed with gingelly oil. 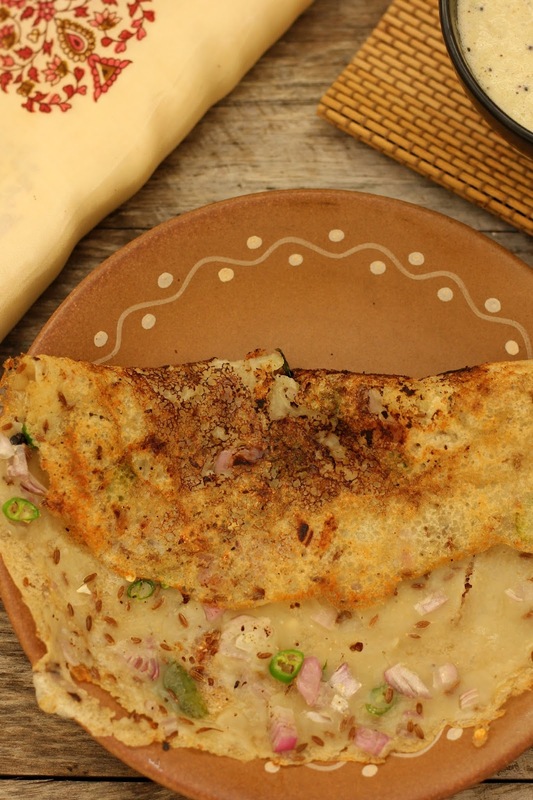 This maida dosai is a bit stretchy, unlike your regular dosai. I like to add a load of chopped onions and green chillies to the batter just before I am going to make the dosai. This dosai works in a pinch when you are out of dosai batter, when you are wont to change into something decent to go buy dosai batter and when upma evokes shrieks and swearing. This Maida dosai is for those times. Mix maida, rice flour and rava in a large bowl. Pour water little at a time and mix to make a thick, lump-free paste. Pour water to make a thin watery batter. Add cumin seeds, black peppercorns, curry leaves, chopped onions and green chillies and mix well. Let batter rest for 1 hour. Heat a tawa till hot. Stir the batter well every time before ladling out batter as the flours tend to sink to the bottom. Ladle about a ¼ cup of batter and pour on the tawa to make a rough circle. This batter doesn’t lend itself to spreading like regular dosai batter, so pour slowly in a rough circle filling out gaps. It doesn’t have to be perfect. Mine never are. Drizzle a little oil all around the dosai. Cook till the underside is crisp and golden. Flip over and cook for half a minute. 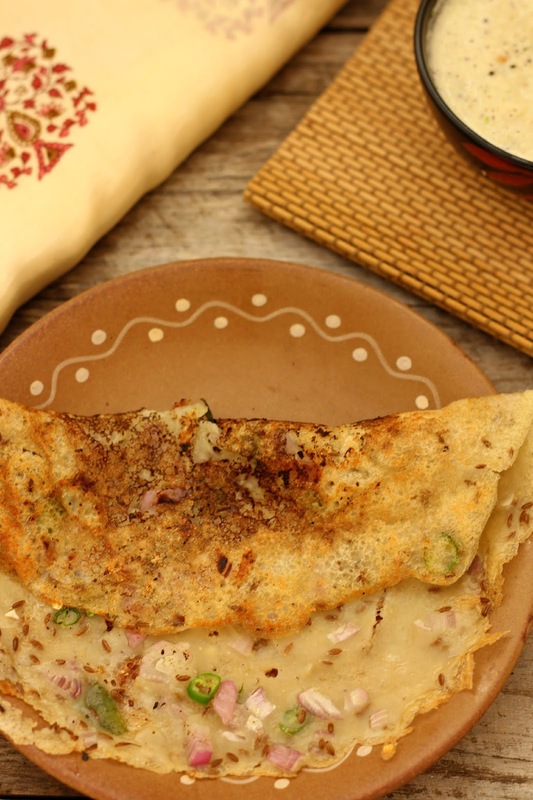 This entry was posted in Tiffin / Breakfast and tagged breakfast, maida dosai, quick dosai, quick no-grind dosai, recipe, south indian, south indian tiffen, tiffen.